You have flown in beginner mode using GPS a few times and are getting comfortable with the controls. You can launch it yourself and bring it back home. You should be able to fly forward, backward and sideways. It is time to spread your wings and break out from the beginner mode. Using the DJI Go App, set the maximal altitude to no more than 120 meters or 400’ as required by the FAA. It’s also time to take some photos. Make sure you have a micro SD card installed in the drone (hint: it goes in upside down). Through the DJI Go App, make sure card is formatted. It’s a good idea to have an extra card with you as they are small, easy to lose and you may otherwise have your only card at home, plugged into your card reader. When there is decent light, I shoot in total manual mode like I do with my SLR and my mirrorless setup. In the App, I always have the histogram showing along with the overexposure warning. To get the most from the sensor, everything from white to black should fall within the boundaries of the histogram (e.g. no clipping). The overexposure warning puts “blinkies” in the areas which are overexposed. I do allow some blinkies as these areas can be recovered when I convert from RAW. Did I mention to shoot in RAW? For image size, I prefer the 4:3 format over the 16:9 and the 3:2 choices. While 35mm film or modern equivalent sensors shoot in 3:2, you get the largest file from the drone with the 4:3 format. You can always throw away pixels in post using any aspect ratio you want. 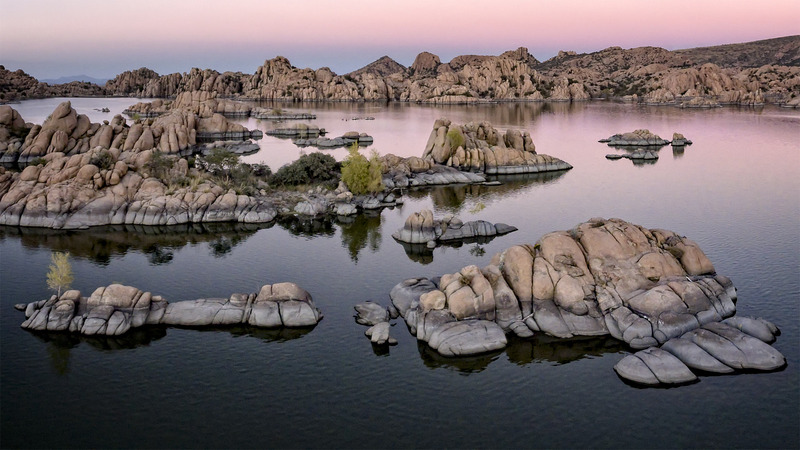 With many subjects, I shoot the 4:3 format and stitch them together into a panoramic. Be sure to have enough overlap from image to image and shoot in rapid succession, to minimize movement of clouds or surf or change in the light. I generally shoot in manual focus, so I can take these shots quickly after I set the focus for the first one. After I shoot a series of images to stitch together later, I aim the camera downward and take a shot. After the download, this last downward image lets me know that I am at the end of that pano series. You can also put the drone into “Tripod Mode” which will make it fly more deliberately with slower motions. This is especially useful in lower light or when flying in wind. I prefer shooting in manual exposure mode too. I try to use the lowest ISO I can get away while keeping the aperture and shutter speed appropriate for the situation. Manual exposure is a natural when shooting panoramics, as scenes stitch together so well. Native ISO is 100 and I use this when I can. For aperture, if you have the Phantom 4 Pro, you are setting a mechanical aperture. Earlier models have an electronic shutter (not as good). Again, in general, I try to stay away from the aperture extremes of f2.8 and 11. As is true for most glass, the best image quality is somewhere in between the extremes. Neutral density (ND) and polarizing filters: I have been using ND filters ever since my first drone. Many feel, and I agree, that with the same ISO, the ND filter necessitates a slower shutter speed, in bright light especially. Using 1/250th instead of 1/1000th of a second seems to give a richer image, less digital looking and less “crispy”. Colors and tonal range seem more pleasing. This has been my experience as well. While some things can be corrected in post, I feel that I have a leg up with ND filters. The last basic (and inexpensive) purchase I can recommend is a monitor hood for your smart device. Many flying situations leave you with tremendous screen glare. This can be a major handicap as you are trying to fly your camera and do “landscape photography”! Cutting out the ambient light is very important! Take it slow. Don’t make your first flight in your living room or near an airport! Learn to fly before you start with drone photography. Update firmware and software at home in the basking glow of your high-speed wireless internet. Make sure your micro SD card is installed, formatted and that you have an extra card. Choose a good launch spot without stringy weeds, metal, overhead branches or nearby major powerlines. Consider buying a drone launch pad. Photograph in “manual mode” as much as possible. Consider your drone as a really tall tripod. Shoot with intention like you would with your favorite SLR or mirrorless rig. Don’t push height limitations just because you can. Be a drone pilot ambassador. When interested people come over to see what you are doing, be gracious. Show them your screen. Give them your attention. Remember this is a noisy and potentially invasive flying camera. We don’t want the public to turn further against us. Be conservative. Think of your next flight! Congratulations! You now have a leg up on producing technically good photographs from your DJI drone. I am very interested in the use of drones in photo today. Thanks for the helpful information. How is your drone photography experience so far?